The Customer shall be liable for any damage to hotel property or severe soiling caused due to wilful misconduct or gross negligence. and severe soiling that are only determined following departure of the Customer or group. 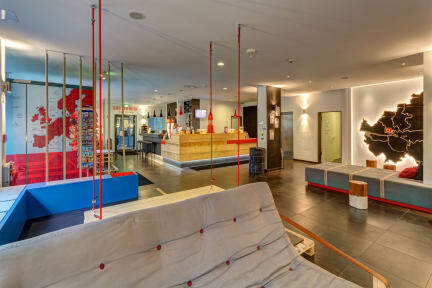 The hotel is located 5 minutes walking from the Altona station in the city centre, between the trendy districts of Ottensen and Sternschanze with their huge variety of shopping and entertainment opportunities. Tourist attractions such as Hamburg's port, the Reeperbahn, St. Pauli and the fish market are all close by and can be easily reached on foot or by public transport. The hotel's spacious lobby has a cosy lounge. Free wireless internet access is available throughout the whole hotel. All the hotel's modern, spacious, non-smoking bedrooms are equipped with TV and telephone. Our lavish 'all you can eat and drink' breakfast buffet is the ideal start to the day, available for a small additional charge. Parking is available in the hotel's own underground car park for an additional charge. Enjoy a very special stay in our modern hotel, thanks to its wonderfully relaxed, cosmopolitan atmosphere mixed in with an masses of Hamburg charm. It provides a meeting point for people of all ages, backgrounds and nationalities. Come to us to relax, meet and talk, work or quite simply have a good night's sleep. For bookings of several beds in dorms, we do not guarantee accommodation in the same room. Earliest check-in time is 3pm on arrival date for all Meininger properties. Of course, guests can arrive before 3pm and leave their bags in our luggage room if required. Important: Please note that our hotel is under construction/ renovations from January until the end of March 2019 and may cause noise disturbance by day. 1.3. Booked meals can be cancelled free of charge until 8 days prior to arrival. Thereafter, a cancellation fee of 100 per cent of the agreed-upon total price applies.